Home\Blog\Is It Still Alive?How to Write a Cover Letter to Grab Attention of a Hiring Manager? Many find cover letter writing the most dreadful part in the entire process of a job search. Candidates fear that it would take too much time and won’t convince their prospective employer enough. Some also say that a cover letter is not that important at all, so it could be totally avoided. While it’s true that not every recruiter would read your cover letter, it does still increase your chances of being hired or at least invited to an interview. Let’s see why it makes sense to write a cover letter for job applications, how you should format and write one, and what the tips are there that make your cover letters work. Do you still need to write a cover letter? We are convinced that a cover letter is not just a purposeless companion to your CV, but your written sales pitch. While a CV states facts about you, your cover letter expands the information about you, illustrates your skills, explains your experience, and communicates your interest. Depending on your situation, there are different types of cover letters. See them below. Before you start drafting your sales pitch, you need to define which kind you should go with. The most popular types include the following five. 1. Job application letter — It is the most common one which you write when applying for an opening that you saw. 2. Value proposition letter — In this letter, your main task is to explain how you are unique as a candidate and better than the rest of your competitors. 3. Letter of interest — You send a letter of interest (or a prospect cover letter) when you don’t know if there are vacancies at the company but are still exploring the grounds. 4. Networking letter — In it, you ask a person for assistance in your job search. 5. Referral cover letter — It is your case when someone from a company has recommended that you apply for the job. Additionally, you can choose between an email cover letter and a standard cover letter. An email is a less formal option, and there is a slightly greater chance that the hiring person will actually read it. Still, a standard one is often specifically required. It should be sent as a separate document. Take a look at a few more examples here. There are some standard cover letter structure requirements. It must consist of the following: contact information, salutation, opening, body, closing, and a signature. Your contact information must include your name, address, telephone, and email. It should be followed by your employer’s contact information: name, position, company, company address, phone, and email. You can avoid this if you are writing an email cover letter. Still, be sure to include your contact details in your email signature. Forget about “Dear Sirs and Madams” or an even worse “To whom it may concern.” Find out who your hiring manager might be and address him or her by name. You can add your objective here, which is a brief statement of your short- or long-term career goals. Basically, you show how you meet the company’s needs. You do so by carefully studying the job description and making sure your cover letter addresses all the main job requirements. If your cover letter is a separate document, then including your handwritten signature followed by your name would be best. If you are sending your cover letter as an email, you need to have a valid email signature with all your contact information in it. Let us now talk about your cover letter layout and all the formatting issues. If you are writing it as a separate document, place your name at the top and left-align it. Make one line empty and write the date followed your employer’s contact details. If you are writing a cover letter as an email, then there is no need in this. Stick to the three-paragraph structure: an opening, body, and closing. Follow by a signature. Make sure that you are using a readable professional font that is not smaller than 12 points. You can go with the employer company’s font to demonstrate your attention to details. Maintain consistency in alignment throughout the letter. Leave enough white space to increase readability and keep the hiring manager engaged. Now that you know what your cover letter content should be and how it all should look like, let’s view some essential cover letter tips. Before you start, familiarize yourself with some cover letter examples. For instance, you can find them here. Or choose the most suitable cover letter sample from here. You must know the name of the person to address him or her properly. Research about the company as well. What does it do? Which instruments, tools, or technologies does it use? What challenges does it currently experience? Maybe you could address their problems in your cover letter and tell them how you would solve them. You can find useful tips how to connect with hiring manager and use more personal approach here. You cover letter must contain unique and relevant information about you, your experience, and your potential employer. If you use an online cover letter creator, similar to this one, it provides you with a simple customized cover letter. You will need to polish it up and make it more personal and eloquent. Whenever you use a template, be sure to adjust it to your style and personality. Never use existing cover letter examples for job application. Include keywords in your cover letter. Look at the job description and use words and phrases that the company is using. Be sure to have some power words in your application letter. This article on Muse might help you choose the right ones. What makes you a great fit for the position? Why the company should consider you over the other candidates? Remember that lying is never an option. Be sure to only include information that can be confirmed by your potential employer. Do not exaggerate as well. All in all, your real achievements will come into light at some point during the recruitment process. Before sending your motivation letter, proofread it carefully. It must contain neither typos nor mistakes. To be absolutely certain, show it to someone else first. These are the things to avoid in your cover letter. In case of spotting them, postpone sending your application. A cover letter is a way for you to establish contact with a hiring manager and improve your chances of being hired. You can either send it to your employer as a separate document or write it as an email (when not specified otherwise). Still, no matter which option you choose, make sure to stick to the formal structure and proper format. 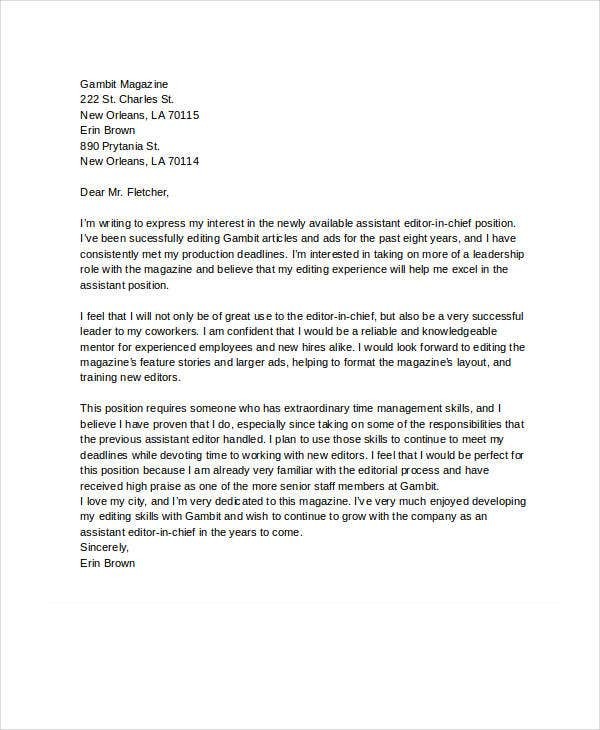 Treat your cover letter as your marketing copy or a sales pitch. Keep it catchy yet professional.